The day Eddy was born, Tim and I made a spontaneous and mutual decision to have a family bed. We knew that he would sleep in bed with us when he was brand new but we registered for a crib, Tim painstakingly painted it yellow, and my mom made beautiful custom bedding. We realized pretty quickly that it would become just a home for stuffed animals and a holding place for clothes that Ed had outgrown. If I listed 100 things about bed sharing, 99 of those things would be positive. Maybe 98. We totally scored having a snuggly sleeper and the family bed has allowed us to keep most of our sleep as it's easy to knock him back out when he stirs. Plus, it's just really sweet to stay in bed together in the morning to wake up slowly. So think of your number one favorite food. Stay with me. The food that you can never resist no matter how full you are or how you're feeling. For me it's French fries. Hand-cut, preferably. I never share my fries so don't ask. And when I make them at home, too many is never enough. Okay, have you picked your food? Now imagine that your favorite person in the whole world climbs into bed beside you, a fresh plate of fries (or what have you), you get a whiff, and think, "You know what? That does sound delicious right now..." Every night. This happens every night. You'd get pretty used to it, right? My point is Eddy has never slept through the night. He generally has at least a six hour stretch and has had a handful of 8 hour ones but not once has he made it from 8 to 8. After we put him down, Tim and I have some "us" time and then join him in bed a few hours later. If he stirs more than a little from that point on he gets a whiff of his favorite food. Served by, of course, his favorite person. On Saturday night, my back was killing me. I couldn't sleep - killing me. I had tried to yoga it out before going to bed but it was still completely pinched. When we lied down in bed I made a split decision to withhold milk. Any position that I nurse him in while in bed requires me to corkscrew my back, even if just slightly, and I just couldn't really muster that on this particular night. When he stirred, I picked him up and attempted to rock him to sleep. It seemed like he was out until I hit the bed and he started crying again. My next trick was the ol' Happiest Baby on the Block shushing method. That worked for about 6 seconds. I got desperate and decided to sing his current favorite song - the one that calms him down while I brush his teeth - the ABCs. After the 28th drowsy rendition, all 3 of us were nearly out. And then he stirred again. After 58 sleepless, hopeless minutes, I gave in. I gave him what he wanted. His favorite meal served in his favorite dish. He was out in 4 minutes which means we were out in about 6. He apologized later that morning by letting us sleep in until 9:30. On the whole spectrum of sleeping woes, this one is pretty paltry. About once a week we talk about what it might look like to move him into his own bed. At the end of all the talk, we both just sucker out and snug closer. I've read all about what it looks like to night-ween a co-sleeper and it's bound to be possible. Will we do things differently with kid 2? Maybe. But I'm not sure how. I know we will still co-sleep but I'm not sure if our routine will look different. After being a die-hard queen bed supporter I now see the benefits of a king. Cozy is an understatement. Oh did I mention that Lucy sleeps with us too? She probably has a few complaints herself. Any co-sleepers out there? How do you move beyond snuggling? I'd love to hear! I was a single Mum with my eldest and she slept with me pretty much until her teens, even then most nights she would end up in my bed. So for me it was natural to co-sleep again with Jarvis. Downside of having a partner this time is the lack of bed space. I get that inch of mattress and most nights have my arse hanging off the bed. After we came back from Fiji when Jarvis was around 13 months I stopped feeding him during the night. It was a lot of work. But now it takes a couple of cuddles and he nods back off to sleep. But if I try to not give him his feed before his morning nap/afternoon nap or bedtime, he arches his back and screams. Plus pulls at my chest. Being only 18 months old and because I cannot have more children I do not see him moving out of our bed any time soon. Because as you said the morning wake up smile and cuddles is my drug of the day. I can completely, and 100% feel you on this one. Olivia is now 19 months old (so crazy, by the way) and we stopped breastfeeding when she was 16 months. We have co-slept since day one, and although we sometimes wished that she would've slept in her crib, we loved having her close. Unlike Eddy, our girl is a wild sleeper. When she was about 14 months, we started a night time routine to get her to sleep in her crib, and after about 3 weeks, it finally started to work. Olivia was the same, when she would sleep next to me and wake up in the middle of the night, she would instantly relate waking up, to feeding, and it started to become really disruptive when she would stir every couple hours. When I finally weaned her (it was terrible, by the way....emotionally, anyway), it seemed to help our sleep schedule A LOT. She would still wake up in the middle of the night, so we'd go in, set her back down, and give her a bottle (later, sippy cup) of whole milk and she would take a sip, and be out in less than five minutes. I think she just missed the act of sucking on something. Once we knew that she realized she wasn't going to be nursed anymore, we would start to let her come in our room when she would wake up. To replace the closeness of breastfeeding, she started to fall asleep with her arms around my neck and it totally made up for the fact that our nursing chapter was over. Now, she drinks a little bit of whole milk at night, and 9 times out of 10, she sleeps through the night. And luckily, our girl is slow moving like us, so when she wakes up at 8am, we bring her back in our bed and we all sleep for another hour, sometimes two ;) and she STILL insists on sleeping with her arms around me, and I love it! Hope my story kind of helped a little! 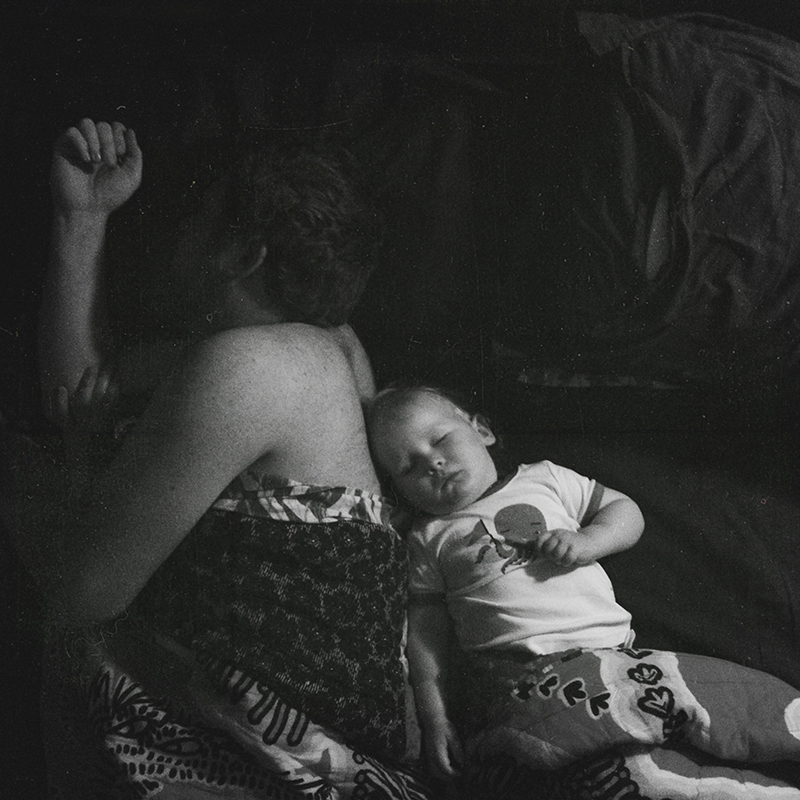 I've been meaning to write a co-sleeping post for a while too. At 15 months we're still at it, and although we too talk about it about once a week, there's still no end in sight. :) I love it too much. 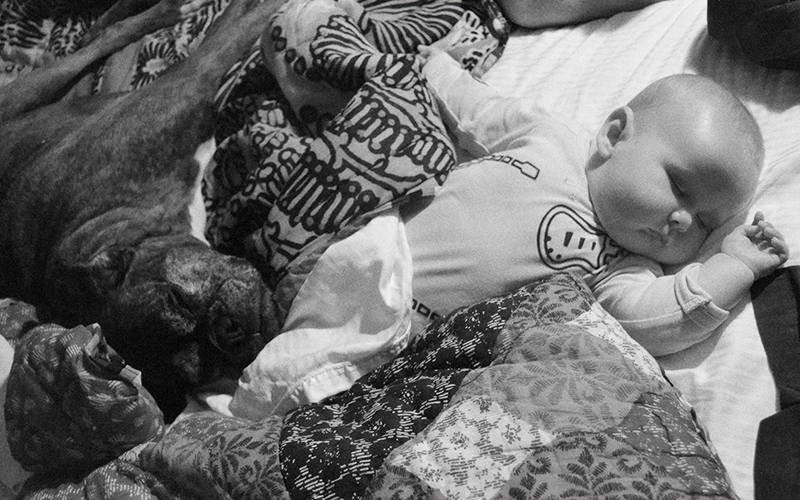 We sent our babies to sleep with an older sister! We co-slept from literally night one (home birth shout out!!) then I think at around 2 months, we decided that 10 pm was too late for baby to go to bed (and we didn't feel comfortable with him in our bed alone, all the way upstairs, and with the door closed to keep out the cats) so we introduced a bed time routine and began putting him to sleep in his crib. At his first wake up, we brought him into our bed the rest of the night. That first stretch of sleep got longer and longer, and for about 3 weeks, he'd sleep a solid 8+ hours in his crib! And then... BAM. We couldn't even put him in his crib the first time. He HATED it. We would try for hours, before giving up and bringing him to bed so we could all sleep. Poor guy. I was an all-night, serve yourself buffet as well. And boy, did it keep me awake! I think it was just past 6 months that I got fed up with the constant every-two-hour feelings and we decided to really clamp down on transitioning. So we did a bit of sleeping in the play pen in our room, and then into the crib he goes. He used to have to be nursed to sleep, now he falls asleep in his crib with some assistance (took about a month and a half to get to this point) and now he's in his crib all night. We were doing good and he was only waking twice (so I would let him nurse) then we were back to waking every two hours (he'd be looking around the room for me, so I'm pretty sure it was a separation thing). We changed our routine again and for the past few nights, dad has been the one to put him to sleep. Baby will let him rub his back and falls asleep in about 10 minutes.. And now he's waking 2-3 times again! Yay! I find "The No-Cry Sleep Solution" by Elizabeth Pantley to be a good resource! And it's even broken down into different categories, including one on co-sleeping, breastfed babes. :) good luck!!!! We also co-slept from Day 1, after a midnight home birth. We too had a queen size bed which was perfect when Doiron was an itty bitty, but we quickly outgrew it and I found myself waking up with only 6" of bed to my name. We decided to move him to his crib around 12 months I think. It was pretty easy for us though because we are still nursing (18 months now) I would nurse him to sleep then place him in his crib. When he woke up I would wait a few minutes, I couldn't last longer than 5, and then nurse him back to sleep. Sometimes in his room in a chair or if I was exhausted, in bed, then I would put him back in his crib. I can't remember how long it took but it wasn't too painful and he sleeps through the night now. On the rare occasion that he wakes, I'll still wait a few minutes and if he can't get back to sleep I'll bring him into our bed (now a king) and let him stay the rest of the night. 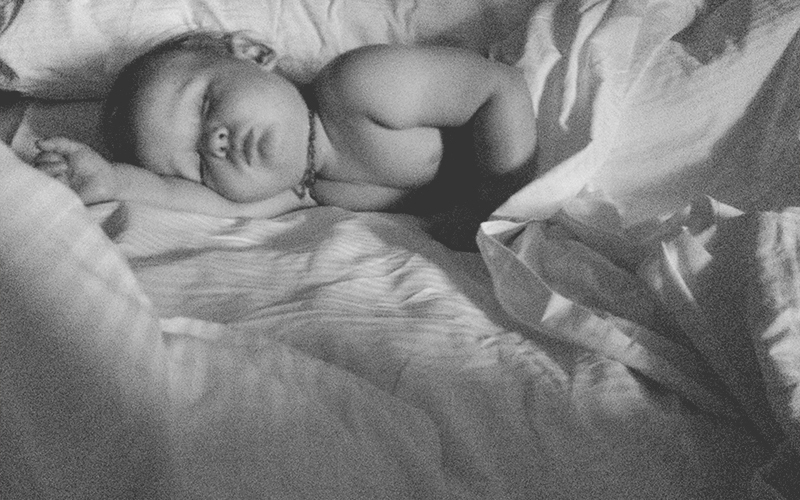 I love our sprinkled nights of co sleeping, it works perfectly for us. Good Luck! I'm a total sucker for bringing my youngest, Joshua, into bed with me at night. I was terrified to co sleep with my eldest, but I tuck J into the crook of my arm & thou it does go numb after a while, it's so cozy and lovely! H won't go back to sleep often, even when he isn't in bed with me, without a feed either!